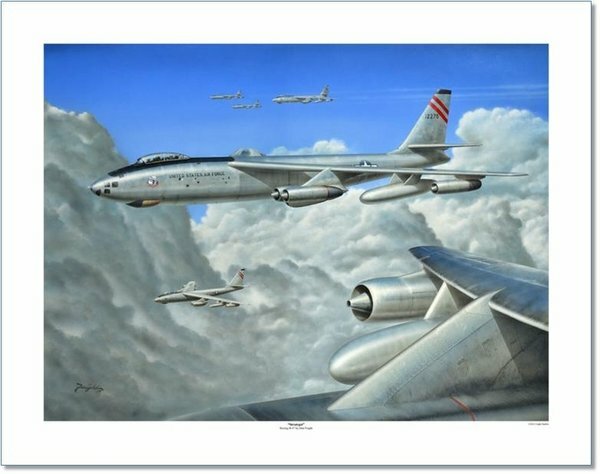 Even though the B-47 began as a design study into a conventional, straight-wing jet bomber, the Stratojet eventually emerged as one of the most modern aircraft in the world. Serving the USAF's Strategic Air Command between 1951 and 1966, the B-47 was faster than many fighters of the period when first introduced. Speed and distance records were broken by Stratojets deployed around the world. In 1954, the first exercise to use inflight refueling covered 6,684 miles in 15 hours. The swept-wing, multi-jet engine design of the Boeing B-47 Stratojet bomber provided a model for commercial jet airliners from the time of its introduction in the late 1940s through the 1960s. Commercial aircraft such as the Boeing 707, the Boeing 747 and the Douglas DC-8 owe their aerodynamic profiles to this Cold War bomber.